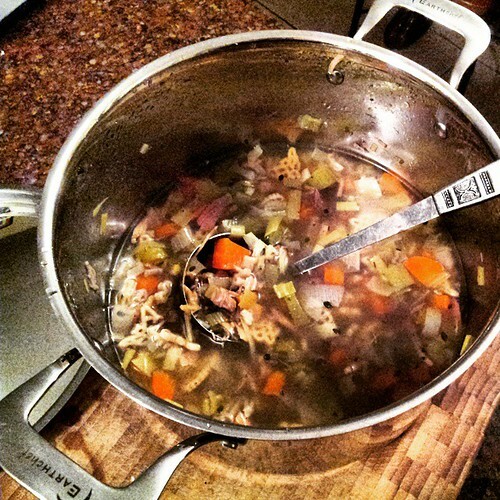 Foul Weather Fowl Soup | What Smells So Good? Bring the broth to a simmer over medium-high heat. Add the carrots, celery, leeks, tamari, thyme, rosemary, poultry seasoning and pepper, stirring to combine. Return to a simmer, reduce the heat to medium low, and simmer (stirring occasionally) until the vegetables are tender, about 20 minutes. Stir in the noodles and chicken* and cook a further 6-7 minutes, until the noodles are done. *If using any of the optional ingredients, add them with the chicken.